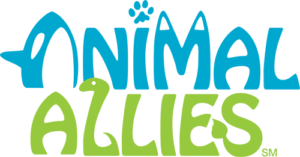 Our FLL Animal Allies season is over. We gave it our best shot, but came up short at the University of Akron FLL District Tournament. I am so proud of the team. We managed to score our highest score in the Robot Games. It was our highest possible score with what we programmed our robot to complete. The team was so excited. We also scored much higher on our Core Values judging. Best of all we had a BLAST! If you have been thinking of creating a team I have just one thing to say. DO IT. Create a team and sign up. I enjoyed the entire season. I admit that I was a stressed out mess during the judging. These kids worked so hard and I wanted the best for them. In the end it all payed off. We won a Judges Award. We got to go home with a trophy to display with many others trophies from various teams from the school over the years. For a rookie team, these kids exceeded my expectations. I can’t wait until next season. I think I’m hooked. 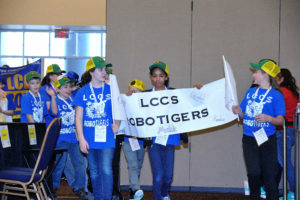 This past weekend my team, the RoboTigers, competed at the NEOFRA Warren Delphi First Lego League Regional Tournament. I must first say that the team of people who run this particular event hit a homerun! The event was incredible. Everyone was very professional and well prepared. With that said, if you are thinking about starting a FLL team, here are some things that I learned after my first competition. You really need to do well on ALL of the presentations. We focused more on the research project. The other presentations (Core Values and Robot Design) are very important also. Overall we did great. We didn’t have the highest score, but we were in the top 7 and advanced on to the regionals next month. 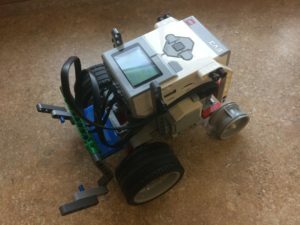 For a first year team of 4-5 graders who have never programmed a robot before, we did incredible. I am so proud of them! If you are thinking about starting a team, GO FOR IT! It was a BLAST! So a few months have gone by and we have been busy. So busy I haven’t posted about our process. Sorry! I am finding out there are lots to do before our competition on December 10. If you are considering starting a team I HIGHLY suggest you find yourself a mentor or join an established team with an experienced coach. Although I did have a coach from another team to ask questions of, I didn’t realize just how much you have to do. I knew about the robot competition and the project, but didn’t realize you have to know and demonstrate how you meet the FLL Core Values. I didn’t realize all the paperwork involved. With that said, this wouldn’t stop me from continuing to coach a FLL team. I know now that much of the work needs to start day 1 instead of a month before competition. Overall, the experience was good. 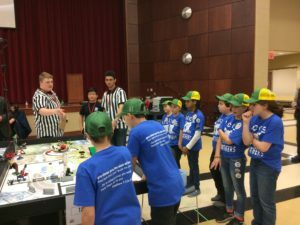 One of the Core Values is “We know our coaches and mentors don’t have all the answers; we learn together.” That includes the FLL competition process. The students and I learned a great deal and had a lot of fun in the process. 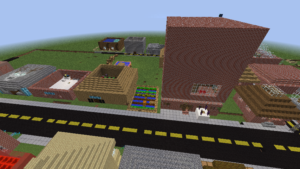 T his is the second year I am using Minecraft in my classroom. As I did last year, students are creating the community/civilization from the literature they have read in their ELA classes. This year I wanted to take the Minecraft build a step further. Many of the students are already very proficient in Minecraft. I wanted them to think and problem solve while they built the Gibb Street Community from the book Seedfolks by Paul Fleischman. 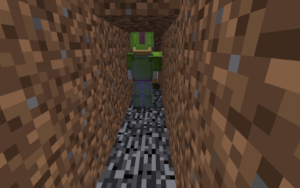 The best way to do this is by allowing students to use ComputerCraft to program turtles to mine and build for them. I also allowed students to automate parts of their build using redstone. (Redstone is a fictional mineral in Minecraft that acts as an electrical wire to build electronic circuits, circuitry gates, pistons, dispensers, and other machines.) Students built all kinds of cool things. My favorite are street lights that actually work when it gets dark. To watch students engage in work so deeply is incredible. They demonstrated their understanding of the text by what they were building. It is a good day when you can have a blast and learn a great deal at the same time. 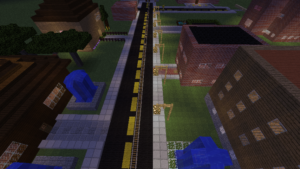 For more on what I have been doing with Minecraft in the Classroom, check out these past posts. For years I have been interested in coaching a First Lego League robotics team. This year I finally get a chance. Through this blog and twitter, I plan to document each step of the way. For those who want to create a team but don’t know where to start, I hope my ups and downs during the season will give you the courage to try coaching a team yourself. I am lucky. My team was already set up before I decided to coach. My daughter’s school was looking for someone to coach a third team they were creating. All I had to do is say yes. I excited that my daughter will also have the opportunity to be on the team. We ordered the materials, so it’s official. I am coaching a FLL team. For our first meeting, we spent time coming up with a team name. We didn’t actually agree on a name yet. I didn’t want to spend all of our time debating, so we will leave that until next week. None of the students have been on a FLL team before. I guess we all will be learning as we go. We also spent time discussing the project and the robot game. This led us to discuss how we interact with animals. I hope that the Twitter in the Classroom series has been helpful as you start to use Twitter to impact your teaching through the connecting with other teachers from around the world. If you are have stumbled upon this post, you can get to series through the links below. Please follow me at @techlane. You have a customized Twitter account, posted tweets and you have started following others. Now it is time to start interacting with other teachers. You do this through something called a Twitter Chat. A Twitter Chat typically has a topic for discussion. There is a moderator that posts a series of questions. Those participating answer the questions. The crazy thing is lots of answers will filter in all at the same time. You stay connected with the chat through the use of a specific hashtag. 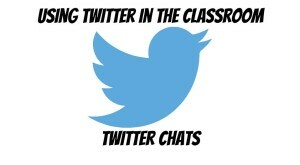 Here is a great list of Twitter Chats on a variety of topics geared for teachers. When in a Twitter Chat I like to use a website called TweetDeck. This seems to allow me to follow along better than using the Twitter website. I also like to use my laptop. It can get overwhelming trying to use my iPad or iPhone. Watch the latest video as I participate in a Twitter Chat. You’ll see how you can learn a great deal and become inspired by those in the chat. These are teachers from around the world. Now that you have a Twitter account and you have customized your page, it is time to start connecting with others through tweeting and following others. One way to connect with others is to search for topics you are interested in following. You can do this by searching topics or by searching a hashtag (#). You also need to start tweeting yourself. Being a teacher is all about sharing our ideas with each other. Watch the next video for a tutorial on posting tweets, searching for topics of interest, and using hashtags. I will further explain hashtags and how to use them also. Be ready to grow your PLN exponentially. 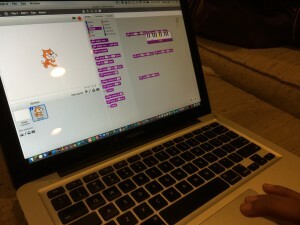 I recently got the Makey Makey out of the drawer to teach my 8 year old how to program using Scratch. She has had some experience using Blockly with her Dash robot by Wonder Workshop. She has also used Scratch Jr. for the iPad, but this is the first time programming for herself. The program was simple, but the impact was great. The program used the “when a key is pressed” event to play a note. Each key played a note in a song from my daughter’s song book she uses for her piano lessons. She had to know the keys and read the music just like when playing the piano. 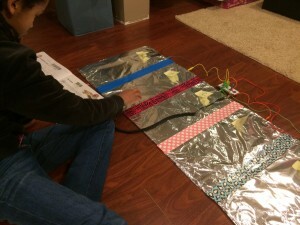 We wired the Makey Makey to match the program. She had to change the half notes (0.5 beat) to quarter notes (0.25 beat). That gave us the opportunity to talk about fractions and decimals. When using the Makey Makey, you have to connect yourself to complete the circuit. This gave us the opportunity to talk about electrical circuits and why our large piano works. We also had a problem solving opportunity. Two of the “keys” had aluminum foil touching. This made two notes play at once. We talked about why the aluminum works to conduct electricity and how the tape and cardboard kept the electricity from one key from connecting to another. To finish our programming, she got to play her song and others. This was a quick 30 minute activity, but we both had a blast and she learned a great deal. 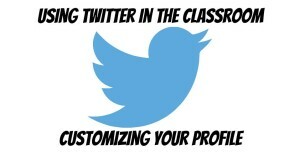 I hope you checked out the last post on using Twitter in your classroom. If you watched, I hope you set up your account. You are on your way to being well connected with others. It is time to customize your account to give it an unique look that lets others know who is behind the account. Customizing doesn’t take that long. 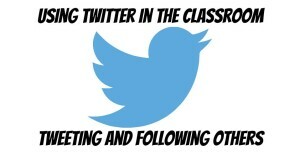 Take a look at the next video in the Twitter in the Classroom series.